As of 12/6/17 we decided to cancel the Dream Rocket Project. However, we will still be running all the scheduled art exhibits. We have decided to place our energies into creating more art opportunities through our art exhibits programming and other projects. After 8 years, we ended the DRP with a collection of nearly 6,500 art submissions. It was a beautiful journey. The Dream Rocket Project launched in 2009, it’s goal was to collect thousands of artworks from various regions of the world. Eventually, all submissions will have been connected side by side to wrap the skeleton of a 385′ Space Launch System (SLS) rocket replica. The wrapped SLS would have been placed on temporary exhibit at locations around the United States. A project inspired by NASA’s mission to Mars and beyond. Above: 4 sides of the wrap. The empty space is where additional art needed to be placed and collected. 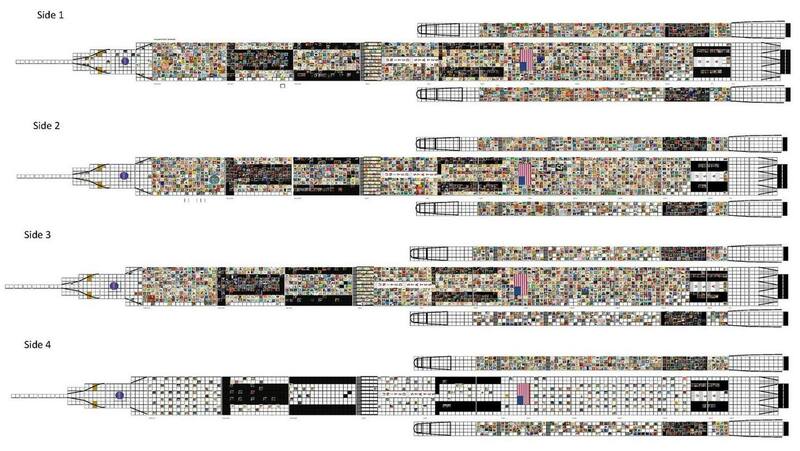 Around 6,500 artworks were collected of 9,000 artworks needed. Submissions were received from individuals residing in dozens of countries, states and in hundreds of communities. Submissions were in the form of textile art accompanied by essays, progress images, reports and examples of innovative approaches inside classrooms across our nation. Art themes ranged from science, space, technology, conservation, education, freedom and equality. Individual submissions have been exhibited in libraries, schools, museums and community centers. Parts and pieces of the SLS wrap submitted. 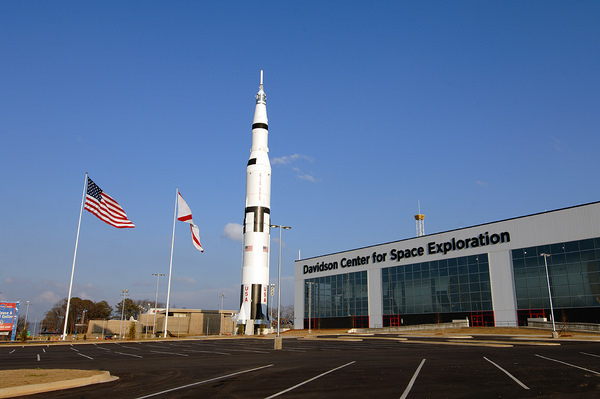 Originally, DRP’s intent was to wrap the 365′ Saturn V Moon rocket replica at the U.S. Space & Rocket Center in Huntsville, AL from May-June 2015, however in October 2014 participants voted to pivot the project to reflect NASA’s current dream rocket, the S LS. A monumental achievement that was marked by collaboration, the Saturn V moon rocket is still considered the only rocket to have carried humans out of the Earth’s orbit (until the SLS is successful): it is the ideal example of realizing an “impossible” dream. DRP estimated that by the time we received our target goal of 9,000 submissions, 36,000+ people will have contributed to a monumental wrap. The social and economic benefits to youth and their communities reveals a vibrant and visible program, marked by collaboration from individuals in all economic sectors. By exposing kids to the importance of collaboration through multi-disciplinary approaches we hoped to inspire them to feel the freedom to DREAM big, THINK big and make a difference. By wrapping the SLS rocket replica with our dreams, the SLS exhibit could serve as an inspiring visual symbol of collaboration and perseverance. DRP worked from 2009 – October 2014 to find ways to wrap either one of these Saturn V’s, however, permission was only granted for the vertical replica version. (Above) U.S. Space & Rocket Center, Huntsville, AL. (Left) Full scale vertical Saturn V replica. (Right in photo) Full scale horizontal.